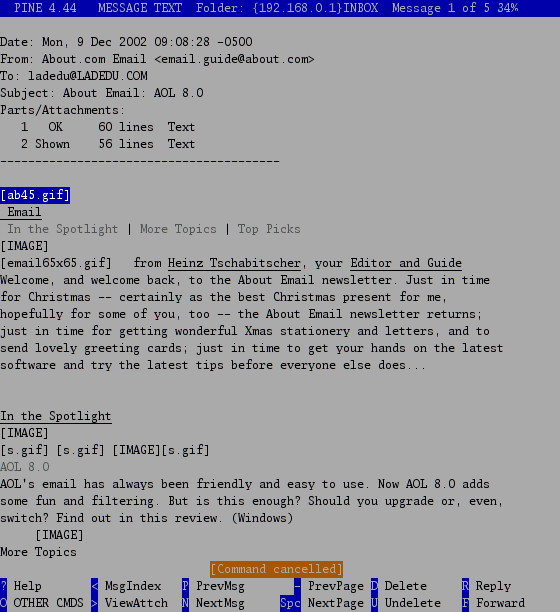 Pine is a flexible and easy to use command line email client that shines with IMAP accounts and in Unix environments but is less usable on a PC or for POP access. Pine is no longer actively developed. Pine lets you access local mailboxes, IMAP and POP accounts, the latter in an online mode. Supports TLS/SSL encryption for server connections and Kerberos or CRAM-MD5 authentication. Simple incoming mail filters (using procmail or another mail filtering utility is preferred). Pine includes a simple, but efficient address bok. Address book and settings can be kept on an IMAP server together with all messages. Pico, Pine's editor, offers proper text rewrapping and a spell checker. A multitude of options (and compile-time settings) lets you configure Pine as you like it. Pine supports colors and message threading in the mailbox display. Offers "roles" for different email identities and templates for often used messages. Pine supports Windows 9x/ME/NT/2000/3/XP, Mac OS X, Linux, BSD and many (most) other Unix variants. Pine is rock solid, highly configurable, and it is easy but quick to operate. Pine treats messages and attachments the right way, and its message editor, Pico, is a helpful companion in composing neatly formatted plain text messages (while creating HTML messages—by hand—lacks comfort and power; you can view incoming HTML mail in Pine, of course). While PC-Pine, a Windows version of Pine exists, Pine feels much more at home in a Unix environment where other programs help it access POP accounts and filter mail. Unfortunately, Pine lacks support for encrypted messages. Pine Is No Longer Developed; What Are the Alternatives? Development of Pine has ended in 2005. A direct successor is available in the open source Alpine, but there are other similar email programs for the command line available as well, of course, including Mutt and Cone.